ronmentally favorable than road transportation . solution to an intermodal one is rather complicated . 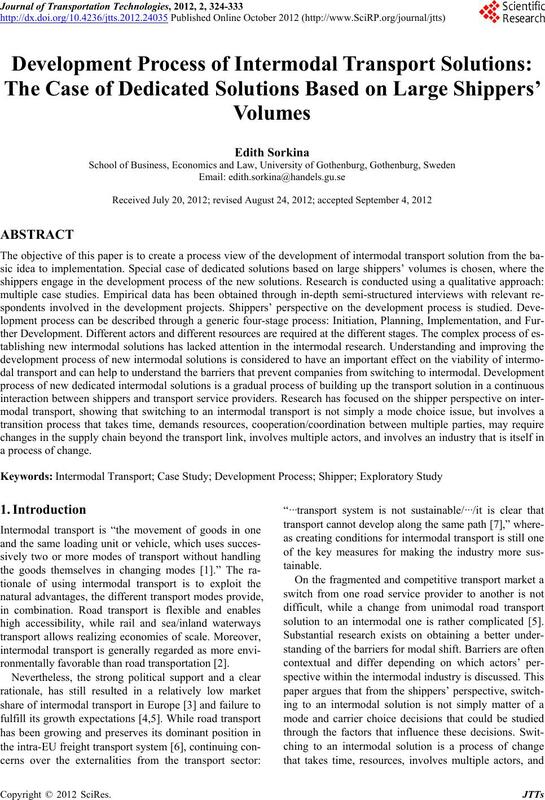 for increasing use of intermodal transport. ent users) can be subjected to changes at later stages. entrepreneur, large lo cal shippers. volumes transported on distances over 300 km . single factor in the change process, but an important one. 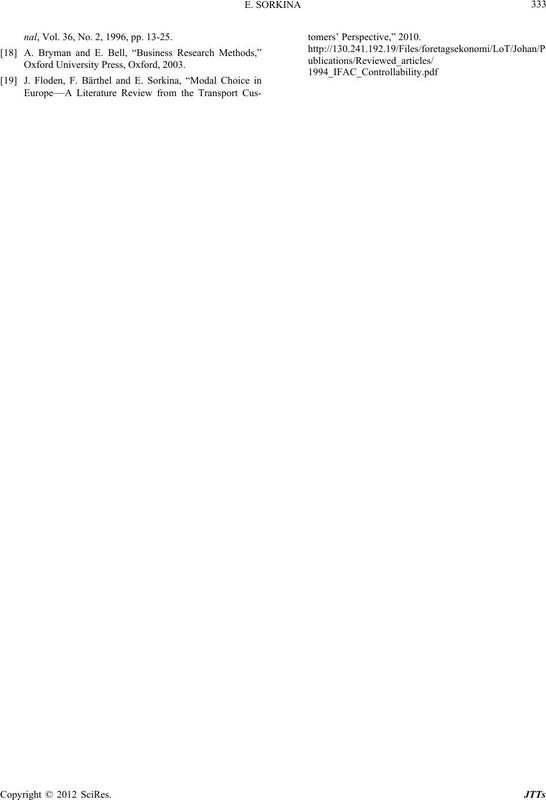 an understan ding of di f ferent views. and industrial applications and aerospace components. region, creating long distance to suppliers and markets. route was served 100% by unimodal road transport. perature sensiti ve go o ds. both due to low utilization of space and risk of damage. 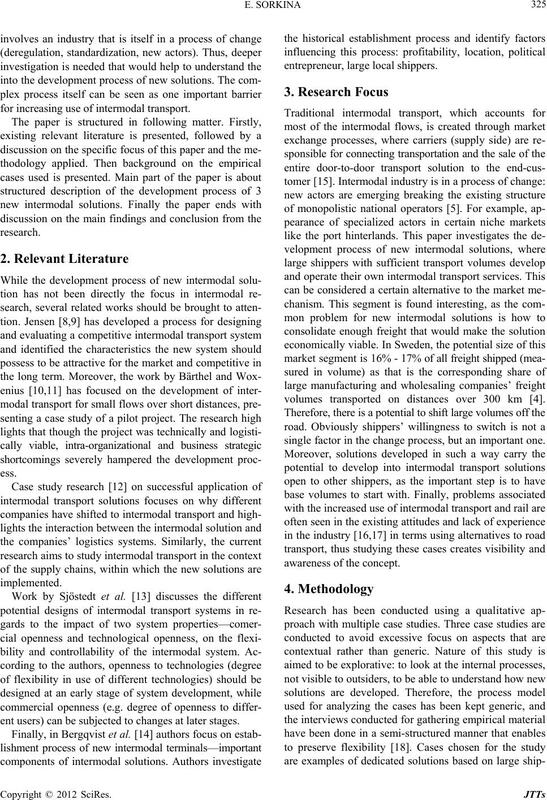 knowledge base for initiating new intermodal solutions. summarizes the important aspects of the initiation phase. intermodal service is developed and gets approved. Table 1. Initiation phase: Case summaries. new solution with no adaptations to the current system. operators for purchase of existing services. a joint company for managing all Coo p’s logistics needs. 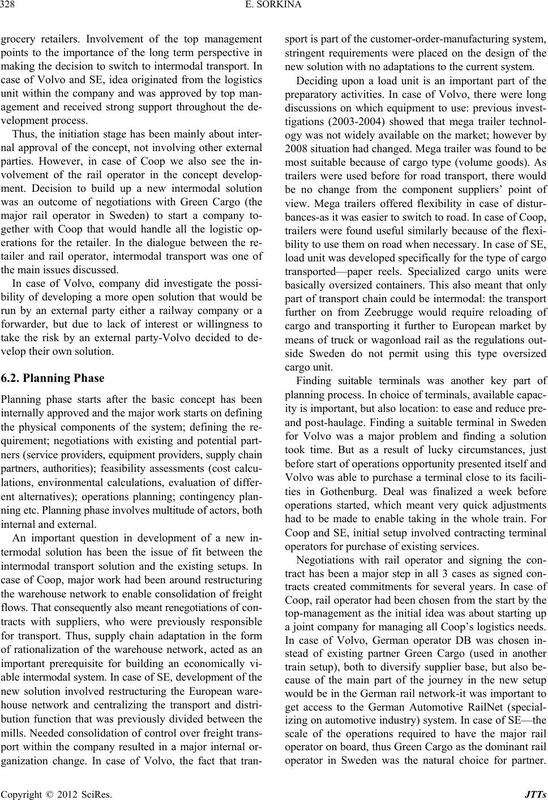 operator in Sweden was the natural choice for partner. 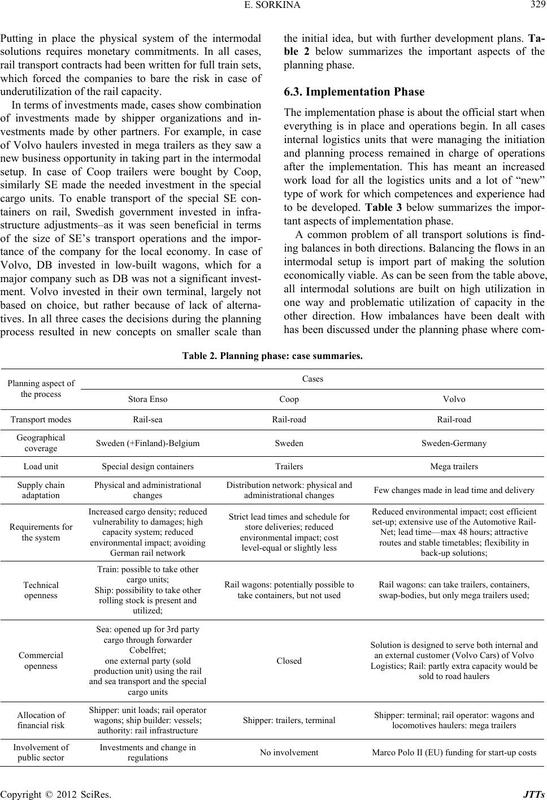 underutilization of the rail capacity. tant aspects o f i mplementati on phase. Table 2. Planning phase: case summarie s.
Table 3. Implementation phase: case summaries. transport, several back-up action plans were put in place. flows on northern route is harder to achieve. 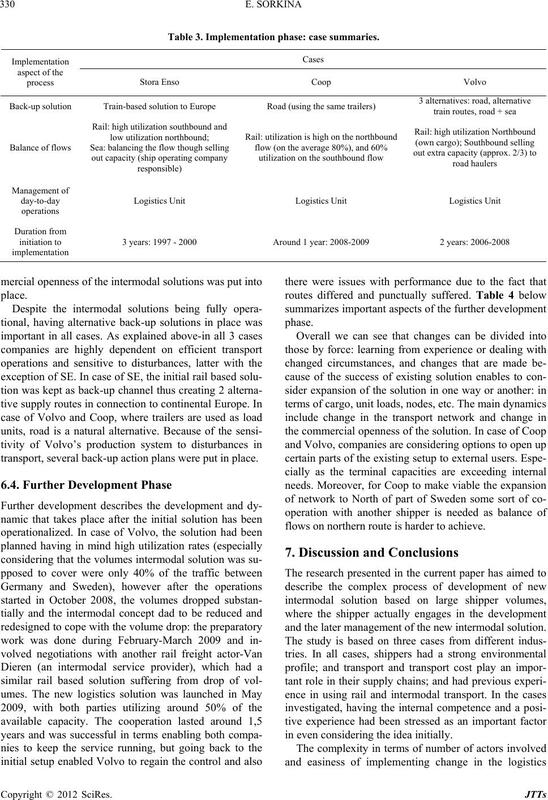 and the later management of the new intermodal solution. in even considering the idea initially. Table 4. Further development phase: case summaries. and new unit load design- took considerable time. supposed be put into operations in a gradual process. to be supported by the vision of the future develop ments. 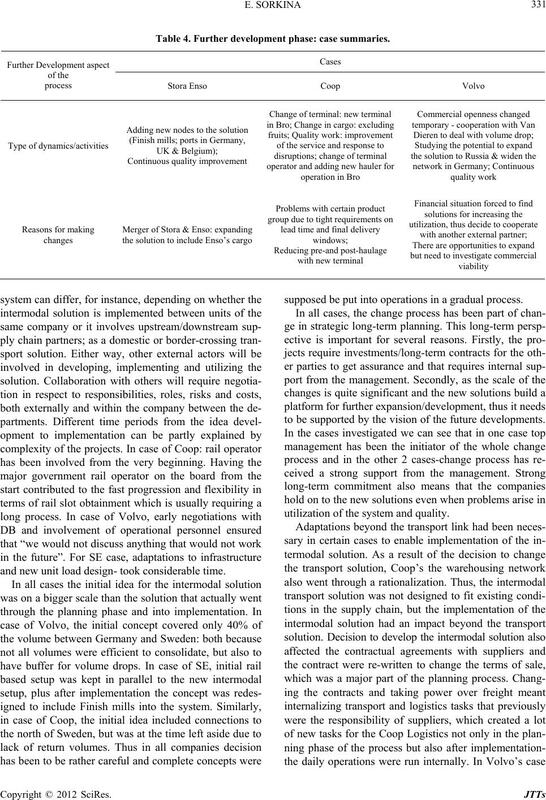 utilization of the system and quality. been made based on lack o f other options. 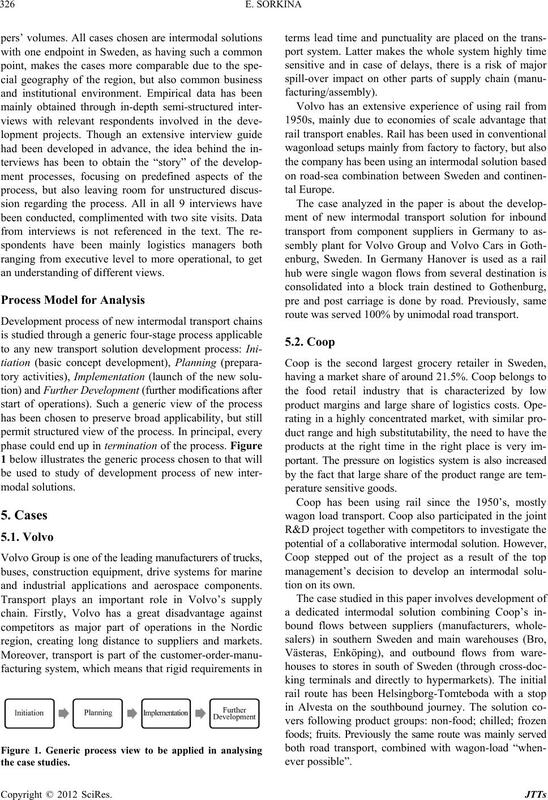 had an existing internal logistics and transport function. aging the new intermodal solution. lutions are built to meet the specific needs of the shipper. 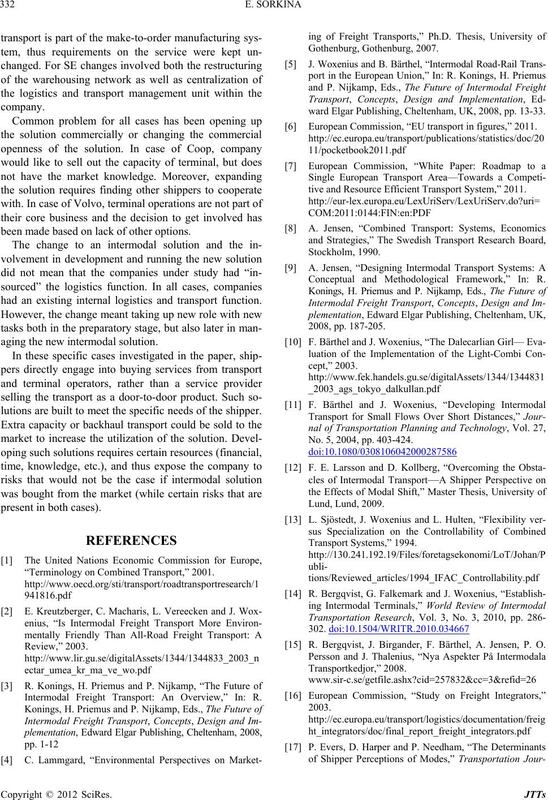 “Terminology on Combined Transport,” 2001. 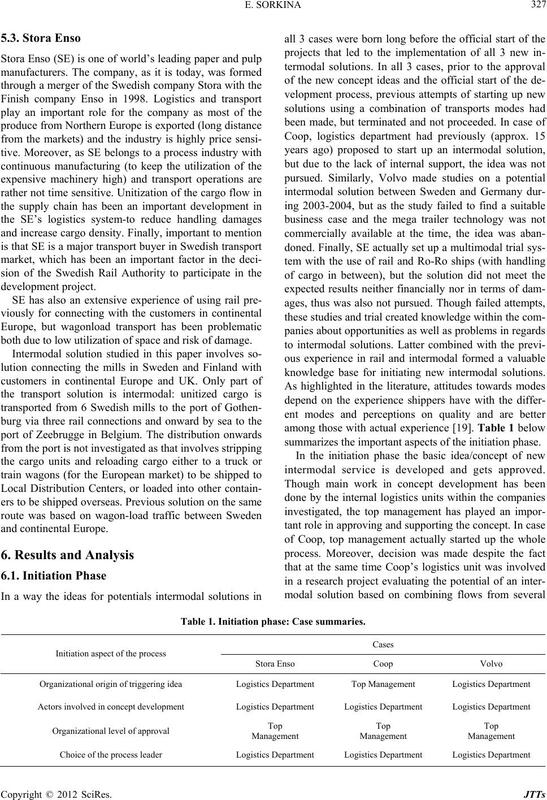 Intermodal Freight Transport: An Overview,” In: R.
ward Elgar Publishing, Cheltenham, UK, 2008, pp. 13-33. European Commission, “EU transport in figures,” 2011.
tive and Resource Efficient Transport System,” 2011. Conceptual and Methodological Framework,” In: R.
No. 5, 2004, pp. 403-424. R. Bergqvist, J. Birgander, F. Bärthel, A. Jensen, P. O.
nal, Vol. 36, No. 2, 1996, pp. 13-25. Oxford University Press, Oxford, 2003.